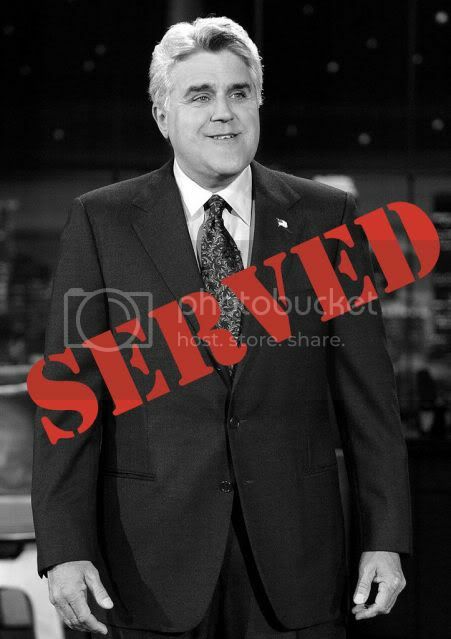 SERVED: Five years ago, Jay Leno announced that in 2009 he would be step down as the host of The Tonight Show and would have Conan O'Brien fill his shoes. He called Conan a gentlemen and didn't want Conan to leave the NBC family, so he said let Conan take the reigns of The Tonight Show. He didn't want to have any animosity or damage to this show and any relationships. I could now wax on about the history of what occurred the past 2 weeks, but there's no need because you all know. NBC decided to cancel Jay Leno's 10PM show, move him back to 11:30 for a half hour, and push Conan O'Brien's Tonight Show to 12:05 (which is not tonight, but tomorrow). Conan released an amazing statement saying NO WAY. The world then responded and we all said, "TEAM CONAN!" Everyone bashed him, from Howard Stern, to local radio, to Conan's writing staff. But no one SERVED Jay Leno quite like Jimmy Kimmel. Jimmy Kimmel responded to this debacle by hosting an entire episode of Jimmy Kimmel Live, his late-night show, dressed as Jay Leno and doing the corny, unfunny gags Jay does. It was a site to see and had the country laughing. It was such a spot on impression and Jay got totally SERVED. But I guess Jay Leno is a glutton for punishment. The Jay Leno show invited Jimmy Kimmel to appear via satellite interview on their show and I don't know what they were thinking. What occurred was the best SERVING of a total late-night prick. Jimmy calls out Jay's vindictive ways and what a traitor he is, how he has no life, and cites the worst prank he ever played as convincing a guy to take over his show and then steal it back 5 years later. Or my favorite, when asked if he'd ever ordered anything off the TV, Jimmy responds, "Like how NBC ordered your show off the TV?" SERVED!!!! Jay gets completely SERVED in the following clip and it's so great to see such a jerk get put in his place. While the country keeps SERVING Jay Leno over and over, nothing felt quite as great and someone saying it to his big-chinned face.